Congratulations on your most recent book “Listening to Tao Yuan Ming”, published by Glass Lyre Press. Can you tell me how this book came to be? When did you know you the writing in this collection was going to become book? I have a long relationship with Kyoto, Japan. I did an independent study there in 1973 focused on Japanese Garden design for my major which was Landscape Architecture. I was also a budding poet in college and was writing while I was there and met the American poet, Edith Shiffert, who just celebrated her one hundredth birthday and still lives in Kyoto. On a subsequent visit to Kyoto in the 90s she introduced me to her friend Akio Saito, who is one of the last in a long line of traditional Nanga painters. We keep in touch and I would visit him anytime I found myself in Kyoto. In the summer of 2012 I spent time with Akio visiting temple gardens and at his studio he showed me a number of his recent paintings. He gave me the painting, a portion of which graces the cover, which depicts the poet Tao Yuan Ming and in his calligraphy has the preface to Tao’s Twenty Poems after Drinking Wine. Tao Yuan Ming (365–427) was the first major Chinese poet to create a personal voice out of his own experience and, as such, was the model for the many poets that followed in the Tang and Sung Dynasties, including Du Fu, Li Po, and Su Tung-po. Also known as Tao Chien, he is one of China’s first nature poets. I have long been familiar with the work of Tao Yuan Ming and was inspired by the gift of the painting to look up Tao’s sequence of poems and was surprised to find that there wasn’t a decent translation of the whole sequence in English. There are a few poems, from the sequence, in quality translations but not the whole set. I was inspired to try me hand at creating versions of the poems stripped to the core of their meaning and inspiration. I initially thought the sequence would make a nice chapbook. I admire the way the three sections work together, yet separately. Was this your original plan or did the sequence evolve over time? Did you have any concerns about how the three sections would come together? The shape of the book grew organically. I utilized A.R. Davis’s book, Tao Yuan Ming: His Works and Their Meaning Cambridge University Press, 1983) as my source text for my versions of the Twenty Poems after Drinking Wine. While I was writing those I was also reading Tao’s other poems and jotting down lines here and there. My study and involvement with Tao’s poetry lead me to start a poetic dialog with him which forms the second section of the book, Letters to Tao Yuan Ming. Some of these poems start off with lines from some of his poems and I write a response to his poem. In others the poems are inspired by other poets. The Sung Dynasty poet Su Dong-po, a thousand years after, wrote harmonizing poems to all of Tao’s poems which is a common practice in the Chinese literary tradition. A Dutch poet, Nachoem Wijnberg, that we are publishing this year kindly sent me a monograph detailing the influence of Tao’s poetry on that of Su Dong-po which inspired the poem, All Those Nights We Harmonized. The poem, If Tao Yuan Came To Visit, was inspired by a poem of the great early 20th century Norwegian poet, Olav Hauge, who wrote a poem inviting Tao to visit his farm in Norway. As I was working on these poems I was also writing poems that seemed in the spirit of Tao and those became the third section, Listening to Tao Yuan Ming. I also included a handful of older poems that seemed to fit in as the collection evolved. Were there any particular challenges in writing this manuscript that you would like to elaborate on? Like most writers when they start a project I didn’t have any idea where the project would lead. My scope at the beginning was modest, to do versions of the Twenty Poems After Drinking Wine cycle. As outlined above the project expanded rather organically to its final shape. Once I had the idea for the structure of the book then most of the challenges were within the individual poems. The bulk of the book was written over a three year period except for the handful of poems in section three that were older work. The shaping of sections two and three also evolved as poems were written and shuffled around in various configurations. When you set out to find a publisher, what made you send the manuscript to Glass Lyre Press? I had poems accepted by Ami for publication in Pirene’s Fountain previously and knew she had started up Glass Lyre Press so I approached her about publishing the first section as a chapbook. She initially accepted the chapbook for publication. When the project evolved into a book length project I went back to Ami with the full manuscript and she graciously accepted the expanded manuscript for publication for which I am very grateful. As an editor of White Pine Press, you of course know what it takes to publish an array of successful literary works. What qualities does the team of Glass Lyre Press possess that make you feel supported as a writer? I have been publishing for over forty years and the literary landscape has changed dramatically over that span of time. When I started in this business the trade was dominated by independent bookstores, each with their own buyer selecting books for that particular store. We then saw the rise (and later the fall) of the chain bookstores where one set of buyers select books for the entire chain of stores around the country. This lead to a drastic reduction of both the independent bookstores and of the diversity of books stocked in the chains. Now we are in a time online bookselling, particularly Amazon, the decline of the chain bookstores, and at least the modest success and survival of the remaining independent bookstores. As publishers we have had to react to these changes and create new ways of doing business. Glass Lyre Press is among a number of new publishers who have developed a new business model. Their model relies more on an online presence and distribution; digital shortrun and on demand printing; and a largely online review media. This model has allowed Ami and her largely volunteer staff to produce a good number of titles with a low overhead. White Pine Press is more traditional based via bookstore distribution as well as online via Amazon and other providers so I am learning from Ami and her team how to reach out further to the online community of bloggers, and readers. In the manuscript, you have found a way to open ancient doors and also stay connected to the present. Was that one of the intentions of the collection? Can you say more about that? When I began reading and writing poetry in college among my first discoveries was the work of the Chinese poet Han-Shan in the translations of Gary Snyder. Snyder’s poetry lead me to the whole Japanese and Chinese poetic tradition, which remains fundamental to my work today. I read the translations of Kenneth Rexroth, Arthur Waley, Jonathan Chaves and others with great interest. Their work lead the way for the many who followed as translators from the Chinese. Today we have many fine translators working to bring both the classic and contemporary voices of China into English in wonderful translations in English. I would say that quite a bit of my writing over the years draws influences from the Chinese and Japanese traditions but Listening to Tao Yuan Ming is the most overt connection to the Chinese tradition. Working with Tao‘s sequence drew me directly into it and the dialog I begin in section two, Letters to Tao Yuan Ming are an attempt to link the openings in those ancient doors with the present as you suggest. In the Chinese tradition there is a long practice of writing what are referred to as harmonizing poems which refer to the poems of an earlier poet. The Sung Dynasty poet Su Dong-po, a thousand years after, wrote harmonizing poems to all of Tao’s poems (of which less than 150 survive). A number of American poets have explored this tradition in their work, a couple that come to mind are Sam Hamill and David Budbill. David has published three collections starting with, Moment to Moment: Poems of a Mountain Recluse, that are responses to the work of Han-Shan and other Chinese and Japanese poets. I found the first section “twenty poems after drinking wine” cathartic. I could hear the wine pouring as I read the poems. Is that still a writing practice you follow? Do you prefer writing after a glass of wine, or does the muse find you no matter what time of day? Well that was Tao Yuan Ming’s practice to write, at least these poems, after drinking wine as the preface indicates. I have written loose versions or visions of the original poems dropping some of the names and particular Chinese references to try to make them more universal and bring out the essence in the poems. While I do enjoy a glass of wine I never found that I wrote better after a quantity of wine. I think I do better without it and often work in the mornings on my poetry. I work on my poetry with irregular frequency since I must also work around editing and publishing White Pine Press and other activities. How do you feel about our histories as writers being someday complete washed away? This thought has caused me much existential angst, and yet when I read it in the poem, it creates a layer of peace over the issue of vanishing. Do you find the thought of absence from the word, troubling? peaceful? or both? I think that we write because we are compelled to but that we also write for the audience that is around us and in our time. No one is able to predict who will be remembered a generation or two down the line much less a millennia. One can imagine that Tao Yuan Ming wrote for his time without much thought that he would be remembered and his work revered a thousand years by Sung Dynasty poets or two thousand years later by us. The vagaries of history and poetic taste are most unpredictable. The Chinese are surprised to find that the zen poet Han-shan is widely admired here when he is considered a minor poet there. The second and third sections, “Letters to Tao Yuan Ming” and “Listening to Tao Yuan Ming” are a beautiful blend of call and response. In your daily practice as a writer, do you remain connected to the messages of Tao Yuan Ming”? Are there other Chinese poets you’ve studied that evoke a similar reaction in you? Thank you. I have been reading Chinese poetry in translation for over four decades and know the work of many of the poets. 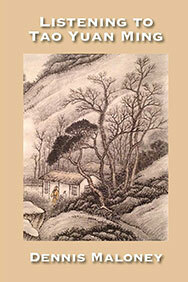 I am particularly fond of Han-shan and the poets in the zen tradition along with Wang Wei, Tu Fu, and Li Po. So Chinese poetry has certainly informed my work as has Japanese poetic tradition. While those have had an impact on my writing I have also been influenced by European and Latin American writing as well as a number of American poets. As I read the collection, I felt pulled back into the forest of time and also pushed forward to our current societal suffering, such as in your poem “I can’t Breathe” for Eric Garner. Did that poem come to you right away or did it take some time? I have often found it difficult to write social, political poetry with the need to avoid the traps of cliché, sentimentality, and propaganda. I was struggling to find a way into a poem and the light bulb went off in my yoga class when the teacher spoke about the central importance of breath and the refrain “I can’t breathe” kept resonating over and over in my mind. Once the inspiration came the poem evolved rather quickly. The Voice of the Bell, one of the older poems in the book grew out of a retreat I did with Thich Nhat Hanh in the early 80s which included Vietnam Veterans. The legacy of the Vietnam War, a central event of our youth, is still playing out in many ways seen and unseen. Your poems are rich with landscapes, lush gardens, meditations, and warm tea. It has been said that each book we write becomes our “literary child”. What are your hopes for this remarkable book? I appreciate your kind words for the collection. My main hope is that I can reach an audience of readers who will enjoy and engage the work. We live in Big Sur, California in the winter and I will be doing a number of readings around the state to promote the book. Of course we like our newest literary child but I am also working on a number of new projects. In the summer of 2014 I was invited to participate in a literary festival in Germany and was engaged with writers from several languages which lead to thoughts on translation and language. I have been co-translating poetry from Spanish and Japanese for several decades so the act of translation and the zones in between the languages have intrigued me. Out of this interest I have been working on a cycle of poems titled “Border Crossings”. The cycle also speaks to suffering of refugees and other social and political concerns we see in Europe currently. A book of my work is being translated into German and will be published there in a bilingual edition later this year so I am hoping to visit in the fall and do some readings to promote the book. Thank you for your time and congratulations on this superb book. Is there anything you would like to add about the book that I did not address? Thank you for your interest in the book and many thanks to Ami and the rest of the team at Glass Lyre for their faith in the book.